The Magisculpt Leopard Print Jersey Dress. I must admit that I do love leopard print and I’m also keen on dresses that have a defined waist or built-in ‘belt’ so this one really caught my eye. 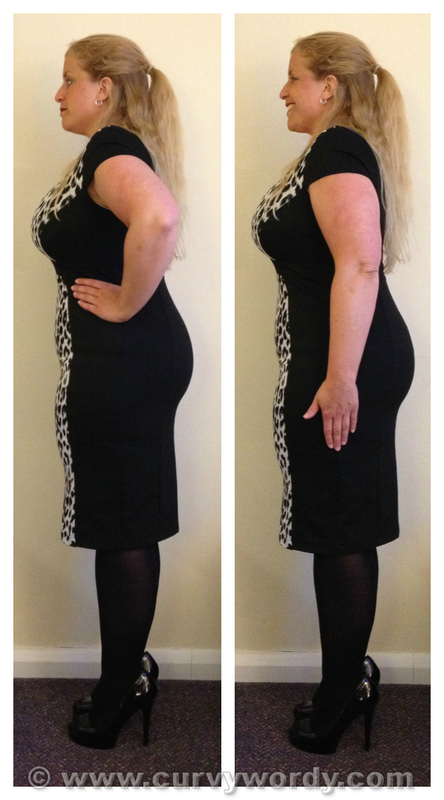 It’s available in sizes 12-32 and in two lengths: 41″ and 45″. I originally tried it in a size 12 as I’d had success with that size when I reviewed the Marisota Coleen Nolan Ruffle Dress. However, I found the fabric to be far less forgiving than that dress and it was heavier and had less give, so I returned the 12 and swapped it for a 14. It was much better! The size 14 fits me very nicely overall, although I would have preferred a little more room on the bust and less room on the waist. But the length of the 41″ dress is perfect for me as it comes to just below my knee. The black and white leopard print panel down the front of the dress is fab and adds a fun look to the dress. There is a small split at the back of the dress for ease of movement and the stretchy fabric is comfortable and supportive to wear. The dress is machine washable and is made from a 79% polyester, 13% viscose, 8% elastane mix. The little cap sleeves offer a decent amount of coverage but I did notice that sometimes a hint of bra would peep out from my underarm area. Whoops! It’s not a huge problem though so I will simply have to make sure I wear a black bra when wearing this dress. …A hidden slip that extends down from the underbust seam that helps smoothe one’s lumps and bumps in the tummy and posterior areas. Not bad, eh? However I found that it only just covered my backside so ideally I would have wanted it to be a little longer. The Marisota website describes this feature as ‘an instant bottom, tummy and thigh shaper’; well, I’m afraid my thighs are rather lower than where this underskirt ends so I don’t think I got any shaping effects from it in that area at all. Despite that, I really like this dress. But, as is so often the case, I found the waist to be rather roomy so I added a belt to solve this issue. Brilliant! The belt does its usual job of adding extra definition to my figure and pulling in my waist where the dress was previously a bit baggy. 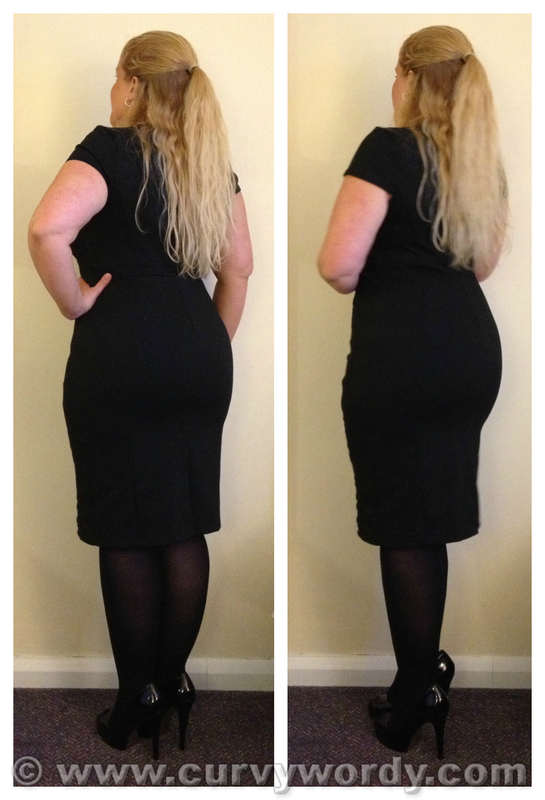 It also helps to minimise the tightness on the bust that I experienced as I am able to wear the waist band slightly higher and hide this fact with the belt. I don’t wear dresses like this in an attempt to make my figure look smaller; this can sometimes be the impression when women choose to wear ‘illusion’ dresses such as this. I wear it because I like it. I think the grey and white animal print looks stunning against the solid black fabric and if this causes a slimming effect then that’s fine but it’s not my reason for choosing this dress. I felt so feminine and girly in the Marisota Magisculpt Leopard Print Jersey Dress that I couldn’t resist pulling a silly ‘kissy face’ pose! If you’re thinking of giving this dress a try I can highly recommend it but, as stated in the item description on the Marisota site, be sure to go with your true dress size in order to get best fit. I am a mixture of sizes due to my proportions but the 14 proved to be best for me in the end. Another great dress on you! I love how this one really shows off your beautiful figure. I shall be adding it to my wishlist immediately. Thank you, Nancy. It's such a great dress! I so look forward to your fun poses. You sure know how to bring a post to life and show how much you like an outfit. You look gorgeous! I'm going to tell my boyfriend about this dress as I think he'll like it on me, I'm a size 24 US so it will look different on me to you but I love bodycons too. I love the dress on you, particularly with the belt as it really shows off the hour glass figure. I headed over to the website-Marisota, and think I am going to buy one myself if I can squeeze it into the budget. Thanks for the review but I am wondering if the tube will stay in place as it isn't sewn into the dress, or will it ride up?